ADS-2fx has now been superseded by the ADS-2sx – all the features, PLUS a capacitor discharge button for reliable installation, above-board LED contacts and a stylish aluminium casing! ADS-2fx is a high-performance, high feature level 2-output DCC accessory decoder with built-in CDU on every output designed to power Seep, Hornby, Peco and similar high current point motors properly and make sure they change every single time! ADS-2fx can be powered with either DC (for DC only layouts) or with DCC to give all the advantages of digital or computer control. ADS-2fx will tolerate a very wide DC input voltage or a wide track bus voltage range and guarantees to give superb results every time. 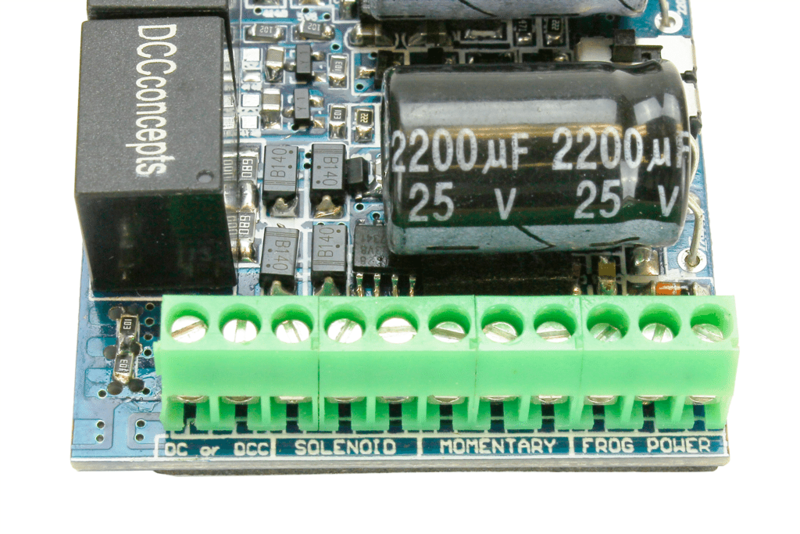 Our specially designed approach to charging control means that power supply loading is very low on both DC or DCC layouts, and because it stores all the energy it needs on-board, when it changes your solenoids it will NOT drain important train-running power from your system. 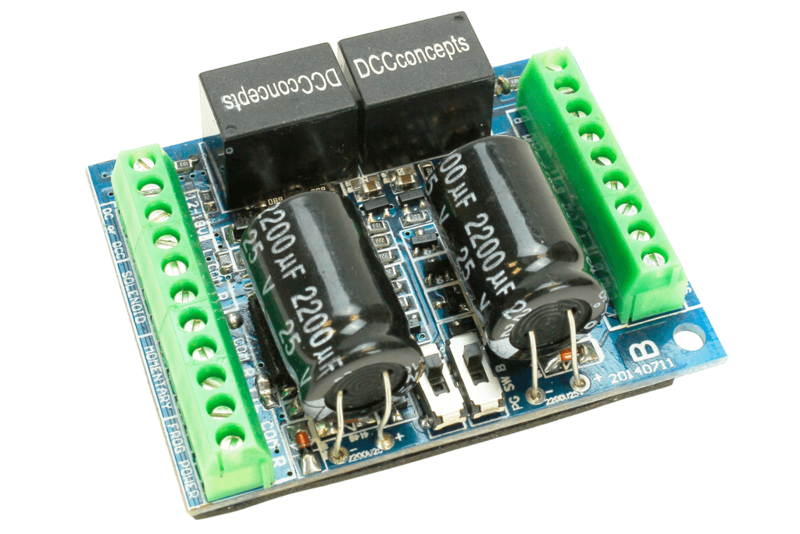 Wiring is also exceptionally simple as no added or secondary power supply is needed and ADS-2fx is designed to connect directly to track power or your accessory power bus. Understanding the wiring and connections is easy too, as they are also clearly printed onto the PCB so you will never forget how it should be done, even if working under the layout! Addressing is so easy that we call it “set” rather than programming – there are no CVs to set and there is no need for special programming either – All it needs is the changing of a simple switch to make it ready to teach – once that is done all you need do it act as if you are already changing it at the address you want it to be, return the switch to the run position and its done. 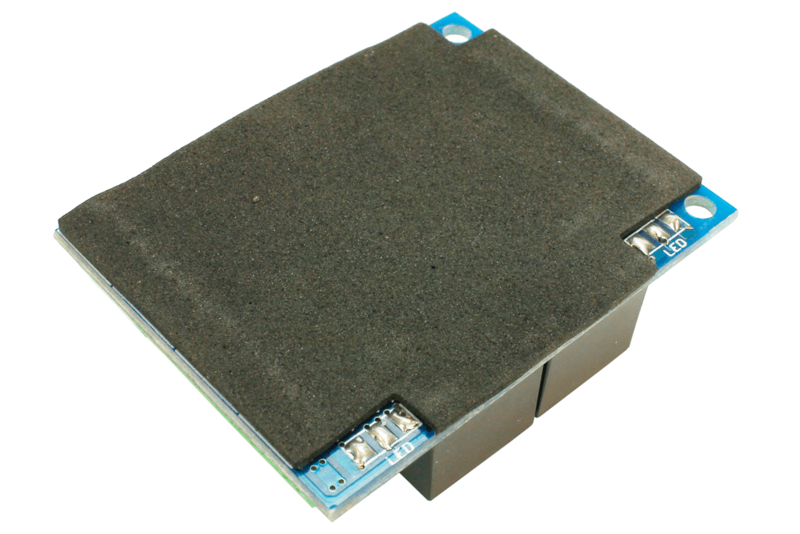 Feedback / IO data is provided via a pair of solder-pads– These output a low voltage as needed with output changing from 0v to +5v for direct connection of position feedback to systems that require it – or to any computer IO interface at all. Main/branch indication can be set by just swapping wires as needed! 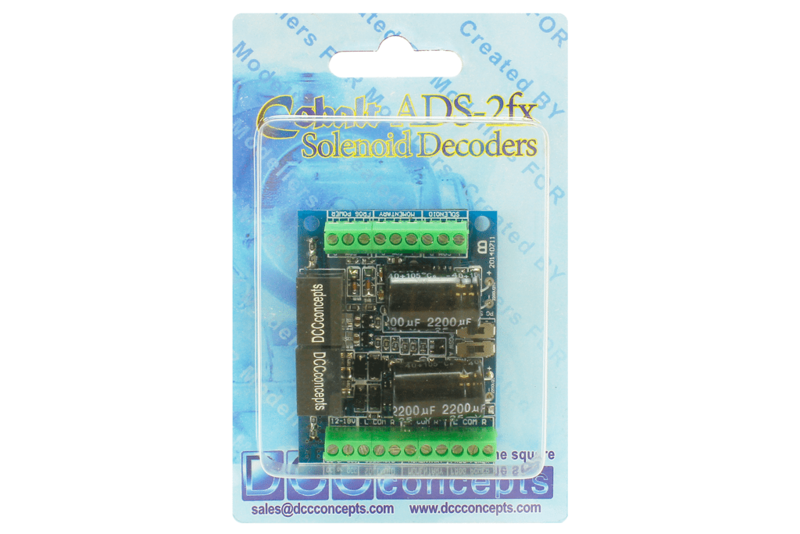 ADS-2fx simply does everything that Solenoid users have always wanted but never received from ANY solenoid motor accessory decoder in the past. ADS-2fx also has really high power available so it can control multiple point motors on each of its outputs, so it is economical too! Unlike all its competitors – ADS-2fx can easily be macro or program driven and will always respond to rapid-fire commands as it is not limited by the ability of the power supply or track bus to fire many solenoids in quick succession! Being able to directly control frog polarity AND be able control panel lights for signals plus offering system or computer feedback makes it something special and when it is connected via our Cobalt-S levers, the combination adds two more changeover switches, making it possible to control almost anything you can think of with nothing extra to buy or install.